Last week WAToday journalist Neil McMahon described Fred Nile’s views on marriage as ‘jurassic’. Apparently, anyone who upholds a traditional, let alone a view of marriage grounded in Scripture, is a bit of a dinosaur. McMahon’s words are another indication of the growing distance between traditional Christianity and current views in society. The challenges are huge, and sometimes confrontational. Much could be said about the often ad hominem nature of such attacks on Christian leaders and the church, although most can see these ungracious and unthinking words for what they are. Even so, I welcome the challenge being placed before the church today. Every new question, even words of attack, give Christians an opportunity to give account for the hope they have. If you were ever wondering what Christianity is about, and why it has survived for 2000 years, and then, through trials and in circumstances considerably more foreboding than our current social climate, you need go no further than what we see unfolding in Charleston, South Carolina. 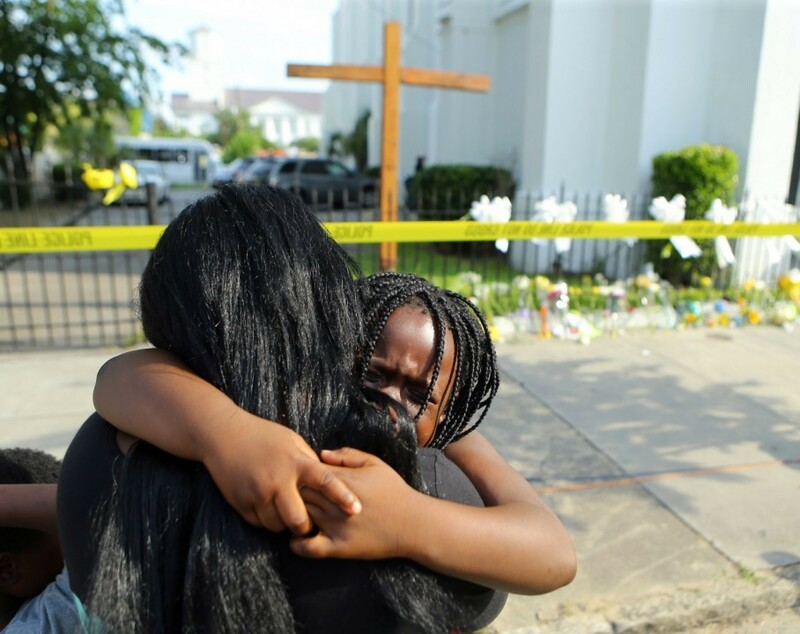 Last week the world looked on in horror as reports unfolded of how Dylann Roof entered the American Methodist Episcopal Church in Charleston, the oldest African American congregation in the country, and murdered nine innocent people. Those murdered had warmly welcomed him into their Bible discussion groups just one hour earlier. At Roof’s first court appearance last Friday, family members were permitted to make statements to the Court where Roof made his first appearance after the shooting. What did those people say? What characterised their words? Bitterness? White knuckled rage? Seething desire for revenge? No. What we saw was Christianity in action. We saw the power of there Risen Jesus at work in his people. We were confronted with words of grace and forgiveness. These words were so powerful, so other worldly, they could only have come from those possessed by the Spirit of Christ. Christians everywhere are deeply moved by their example. We thank God for their grace and courage. May their words be echoed, repeated, whispered – through our tears – for years to come. What is Christianity? It is how God, through Jesus’ death and resurrection, breaks the power of evil in human lives, and through his Spirit begins transforming them, and their world, so Jesus’ new life comes to glorious expression . This is the Christianity, the Jesus, the Gospel our world needs to see and believe. And yes, Neil McMahon, such words are old, but they carry more power and grace than you can imagine. They change lives. They heal hurts. And they breathe life into our world’s most broken and tragic places. I suppose with everything that happened with my exit from Redlands, my confidence had been slam dunked. I would be the first to say that I do not always find criticism easy to manage. But in this case what was said (admittedly by a small number of people) disturbed and appalled me. It left me bruised, broken, and damaged. You can move on physically and take up residence on the other side of the country. But those voices stayed with me. They worked to undermine my desire to write regularly. They attacked my ability to pastor with confidence, to preach with a sense of urgency and passion, to do anything worthwhile, really. Maybe it was only those close to me that noticed my struggle, or felt it. Most of the time I survived by pushing through these darker times, praying that God would help me through, and that he would enable me to stand. It’s an odd thing, really, how voices of untruth and ungrace can be so dogged and persistent in your mind. Rationally, of course, you can work it all through. You know what has been said is a lie. You know it is untrue. You’re aware of all the other dynamics in the situation. But beyond all your rationalisation, the evil one delights to use these voices as his own. He uses them to undermine the reality of what Jesus has done in you and for you. The accuser always attempts to recast Gospel reality into an ugly, chaotic falsehood. In my case, those voices spoke to my own insecurities. They exposed my tendency to want to do things in my own strength. To protect myself with my own defences. To answer the voice of accusation with my own resources. What a curse self reliance is. How much better to have answered as Jesus did, throwing himself on the faithfulness of the Father, and citing the Word to the accuser’s face. So, in reality, an absence of writing was an indication that the voices of the past were still demonising me. So, what has changed? Well, I am seeking to live more in the strength of Jesus and his work in me and for me. It is his reality which determines who I am today and what I do. His truth sets the agenda, and it conquers every malicious voice the accuser might seek to use. Of course, I have known Jesus’ reality for around four decades now. And it’s true that I never ‘unknew’ those wonderful truths. But it’s also true that everything which has happened has given me a fresh opportunity to embrace and own the good news again. It’s a daily decision to follow truth, and to place your trust in it. Over recent months I have been reading posts from Don Miller’s Storyline blog. Miller’s blog has example after example of people impacted deeply by the grace of Jesus, and who want to live in that reality. A few years ago, I read Miller’s book ‘A Million Miles in a Thousand Years’ Here again, the book works with the story metaphor. It challenged me to think of what kind of story I am living, what kind of part I am playing, what kind of character I am becoming. Then, a few weeks ago, I had one of these ‘aha’ moments. It is reflected in how often the first person pronoun is used in the last sentence of the previous paragraph. Here is the profound reality: I get to make the decisions about my story, my part, my character. Sure, God is sovereign, and I believe that were it not for his love my will would be bound in all rebellion and the fall. But in his grace I am still a free agent. Jesus calls me to live his new life and his better way. On top of that, Jesus lives in me through his Spirit, recreating my inner nature, and empowering me – albeit imperfectly – to follow where he leads. Here’s the point: Because of Jesus, I get to decide where my life is going, and how my story is unfolding. And those voices? Well, they don’t get to shape my story any more. No longer do they have the capacity to influence the unfolding events of my life. I own my story. And in Jesus’ name I am embracing his work of change and transformation. Those ugly voices will still appear from time to time. But the grace of Jesus speaks a more beautiful and liberating reality.